"I actually bought this excellent book myself rather than get a review copy sent and I'm glad I did as it's a little gem. It does more than just cover the tip of the iceberg and offers a well researched and presented account of the campaign, from inception through to completion. 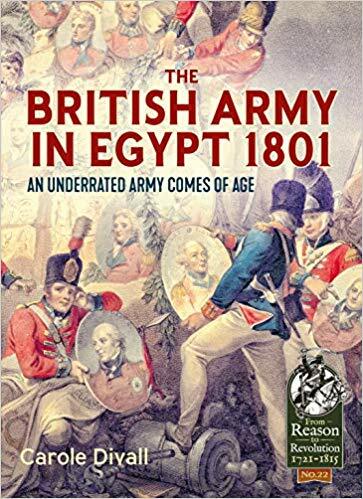 Lessons learnt carrying out opposed amphibious landings at Calantsoog against Batavian troops in 1799 were put to good use when the army stormed ashore in Egypt. In other areas too the campaign helped shape the poorly-regarded British Army into the fighting machine we like to think of during the Napoleonic Wars. The book contains many super colour plates to complement some really handy (sadly not always the case these days) maps and orders of battle. The pen pictures of the main commanders and each regiment or corps involved are really useful. Highly recommended." I like Carole Divall's books – they are always well researched and very readable. I knew she was writing a book about Abercromby, but this looks even more interesting. Helion have brought out some good Napoleonic titles recently. One day I'll unbag the lead I have for this army and paint it. many super colour plates, by which artist? Sorry Lilian! I missed this post.